Easy connection in Bogotá airport with good signage makes it easy for a first time traveller transiting through Bogotá. Security for all passenger is strict and there was multiple checks of my backpack. Fortunately, the whole process was very orderly and pleasant with not much queues on my first transit. 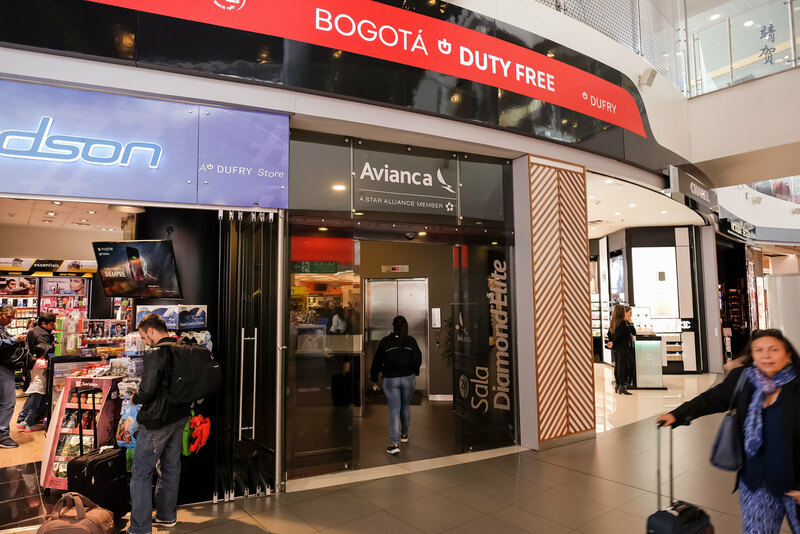 Duty free shops line the area straight after security before the entrance to the Avianca lounges located on the second floor. 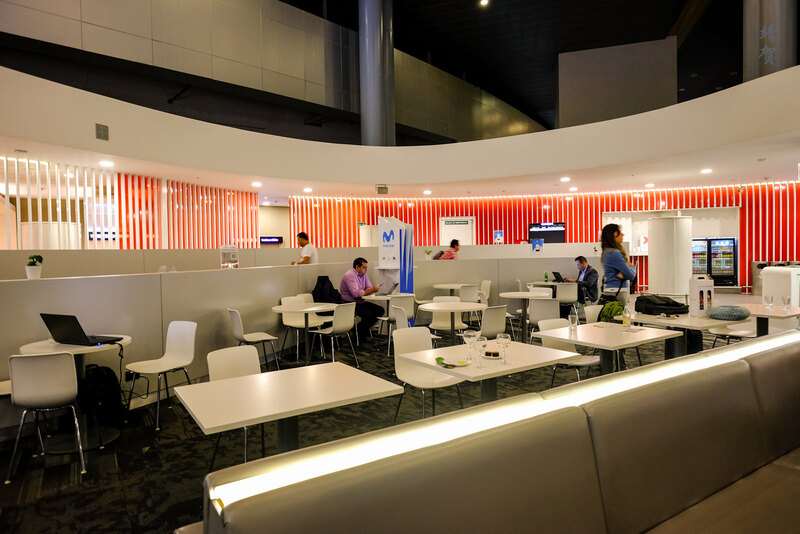 There are 2 separate lounges, one for Star Alliance Gold members and another for their Diamond members. 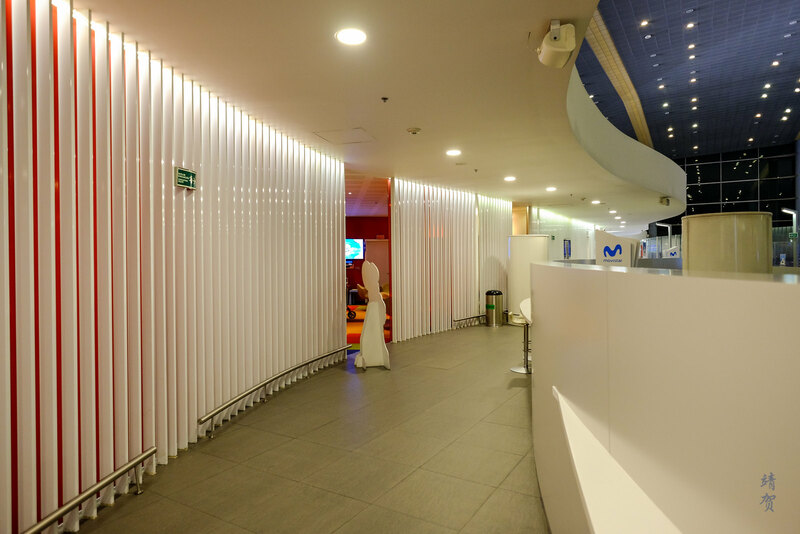 There was no problem for Business class passengers to enter both lounges and it was next to my departure gate 32. 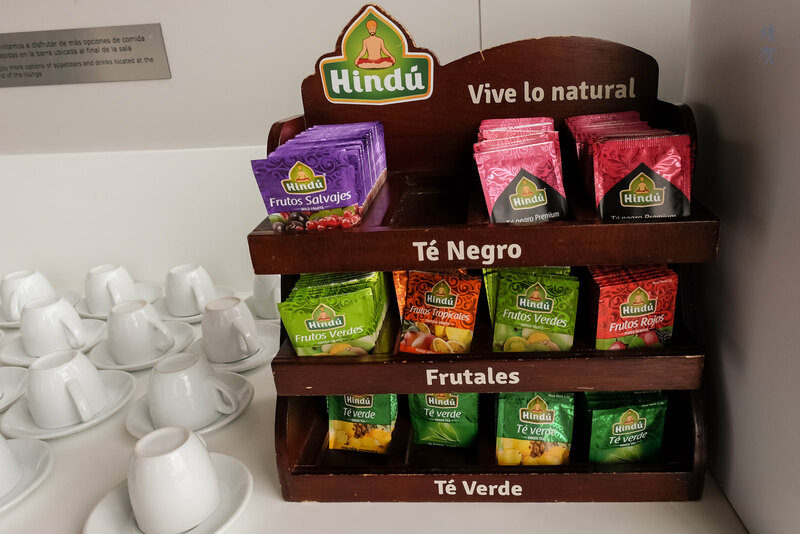 The first lounge on my way to Lima I visited was the Diamond lounge. 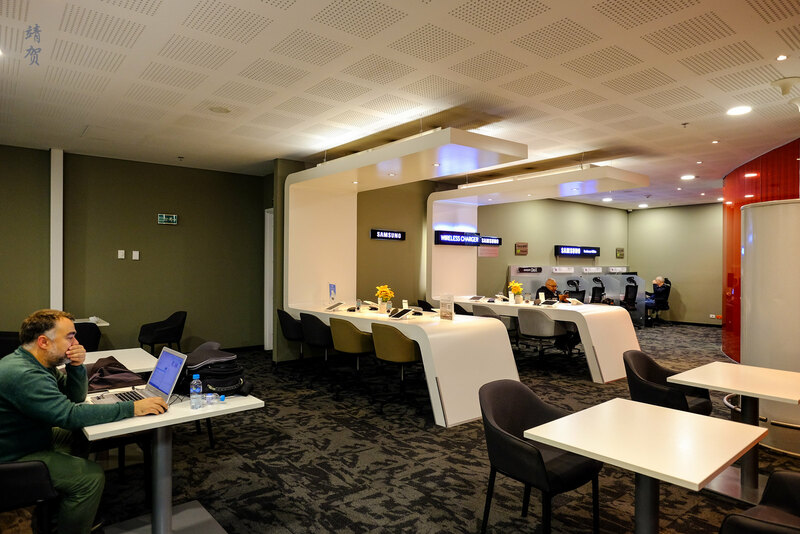 Business class passengers have access to both sides of the lounge and my experience was that the agents did not bother between guests of both lounges as there is a connector between them. 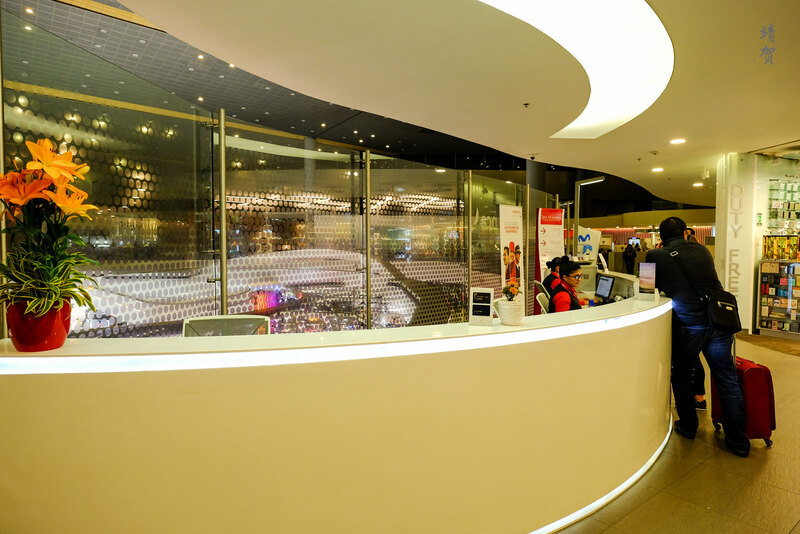 The reason I visited the Diamond lounge first was that the entrance was visible as it was beside the duty free stores on the departure ground level. 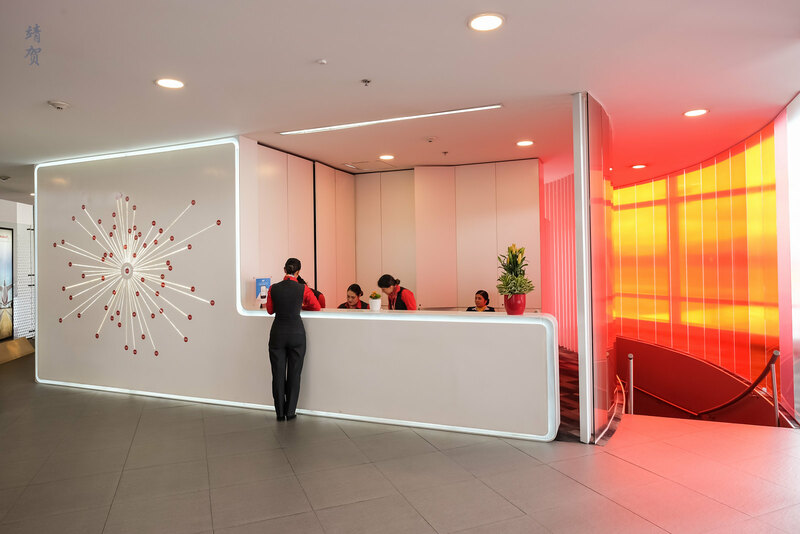 My access was checked at the ground level but there was a larger reception desk on the second floor where the lounge facilities are located at. 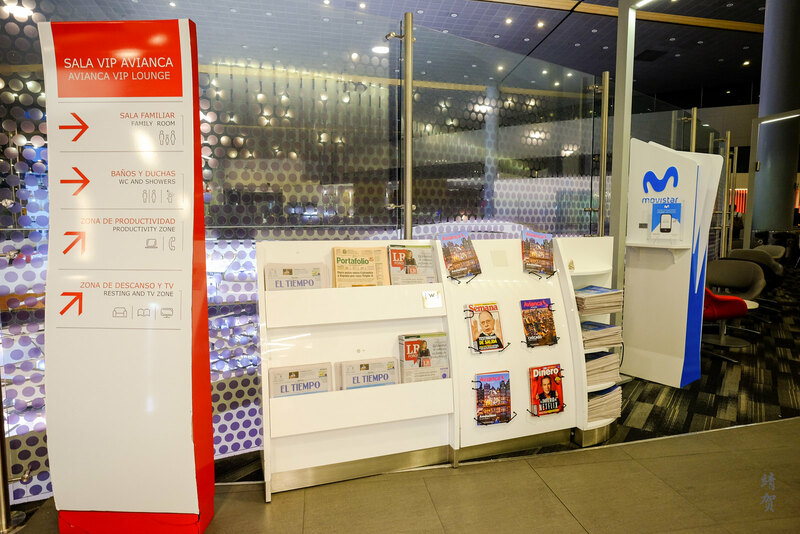 Along the hallway leading to the lounge, there was a magazine rack with daily newspapers though most of them are in Spanish or Portuguese. Next to the rack was a charging station that seems to be sponsored by Movistar, a Latin American telecoms company. 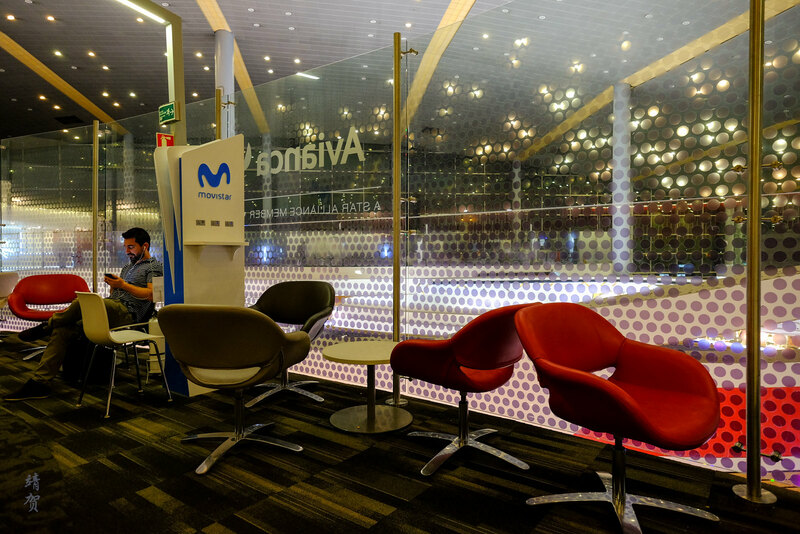 WiFi in the lounge was also provided by Movistar. Past the entrance section, the lounge was very well lit during the day as there was natural light from the windows and there was plenty of comfortable seats. 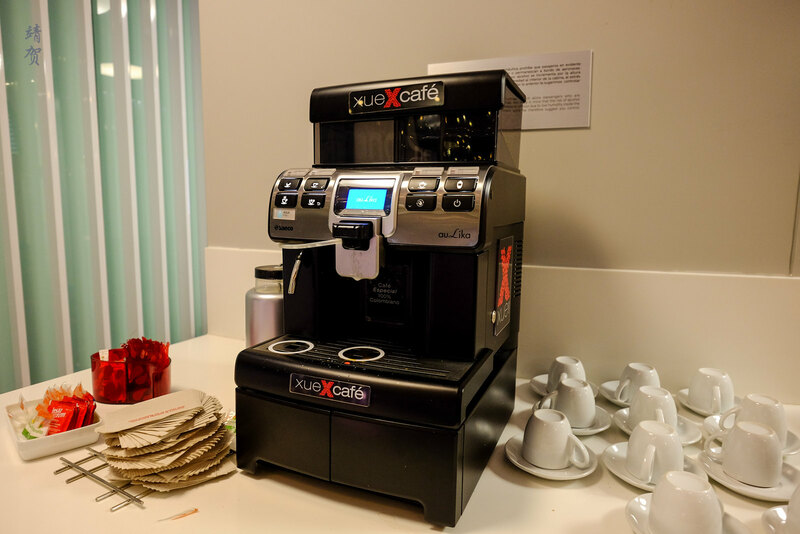 There was an espresso machine with tea and soft drinks on the first section of the lounge. 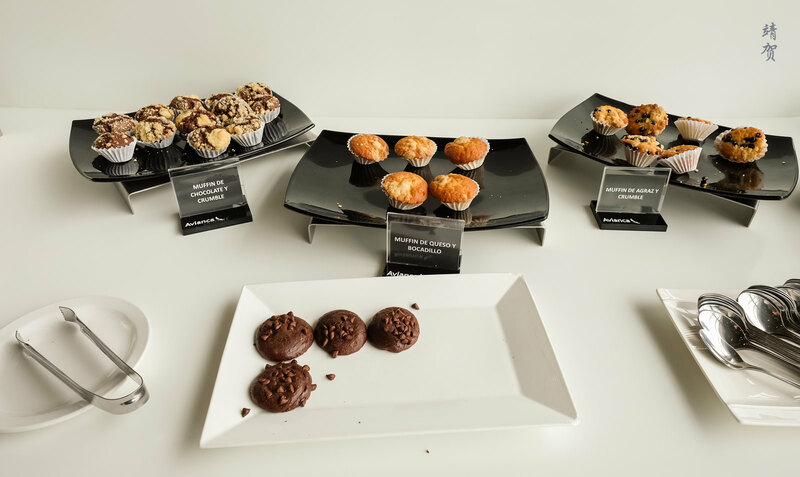 Cookies and muffins with packaged snacks can also be found in the buffet console beside the coffee and tea area. 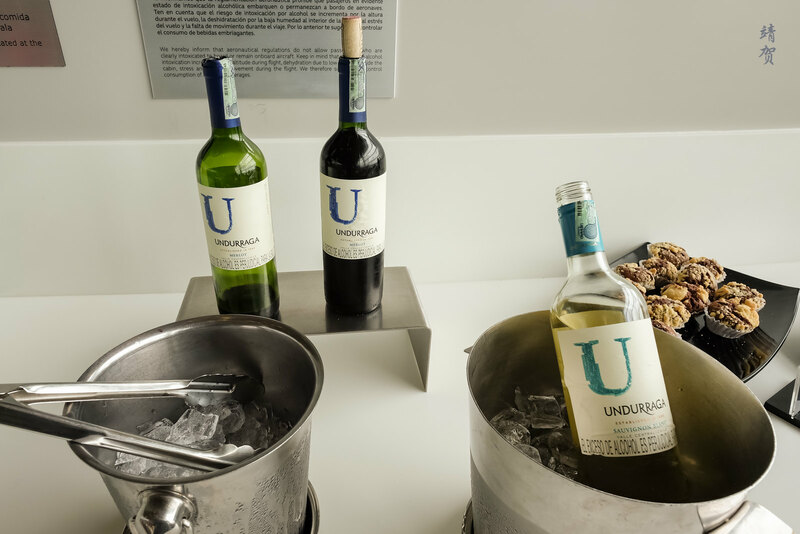 Chilean wines are also served in the lounge. 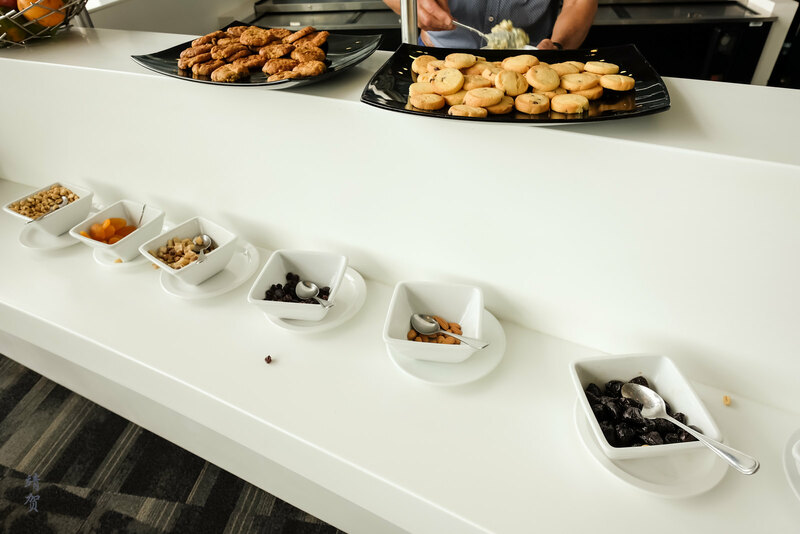 Next to the first console, there was plenty of seats for guests to be seated to enjoy their coffee and snacks. 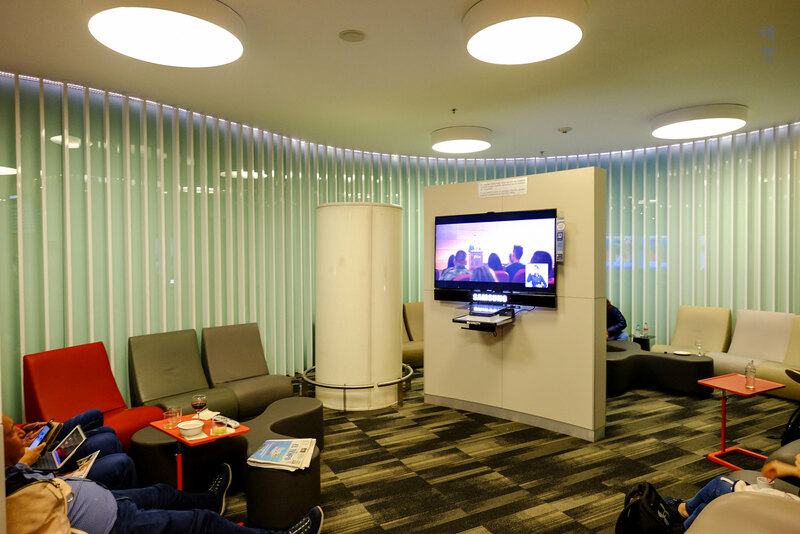 In the middle section of the lounge, there was a shielded area with recliner lounge chairs on one side and a TV with a gaming console on the other side. This area has some guests seeking a more private space for taking a nap or to play some games. 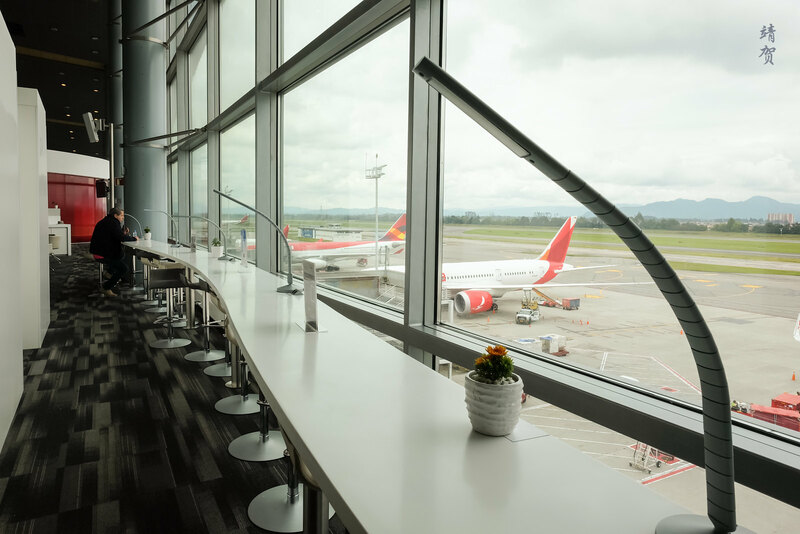 One great thing about the Diamond lounge was the tarmac views as there was a bar table with stools where guests can work from or enjoy some snacks while admiring views of Avianca jets. 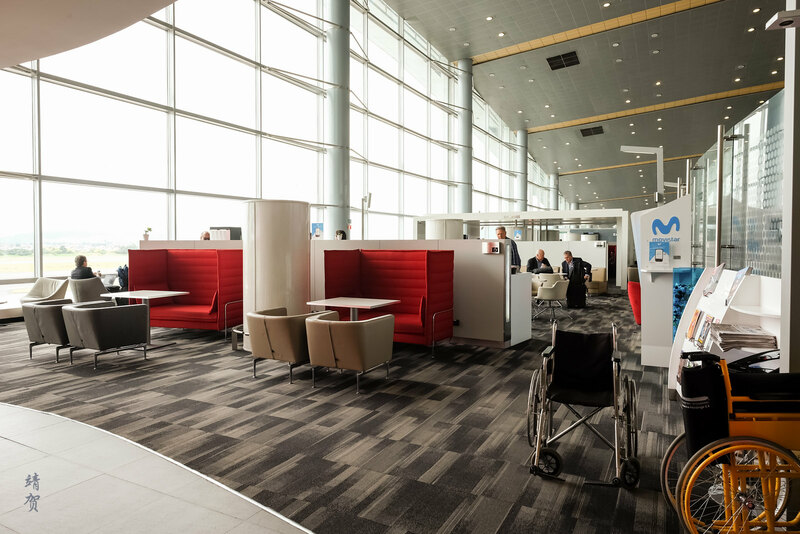 There were more variety of seating arrangements in the center of the lounge with high backed lounge chairs and standard armchairs in red. These chairs are arranged in such a way to prevent most guests from facing each other with small tables set between for space to place magazines, bags and drinks. 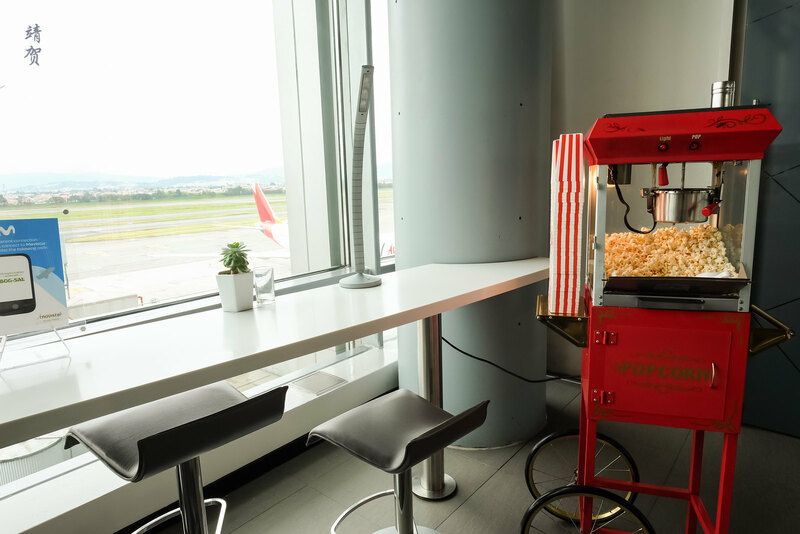 At the end of the lounge, there is a popcorn machine along with a more extensive buffet area. 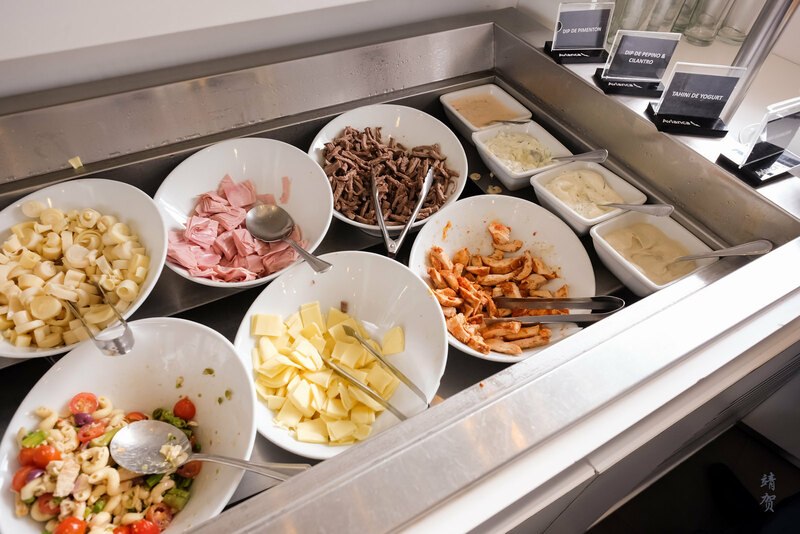 The more substantial buffet counter has more filling dishes featuring a pasta and salad bar. 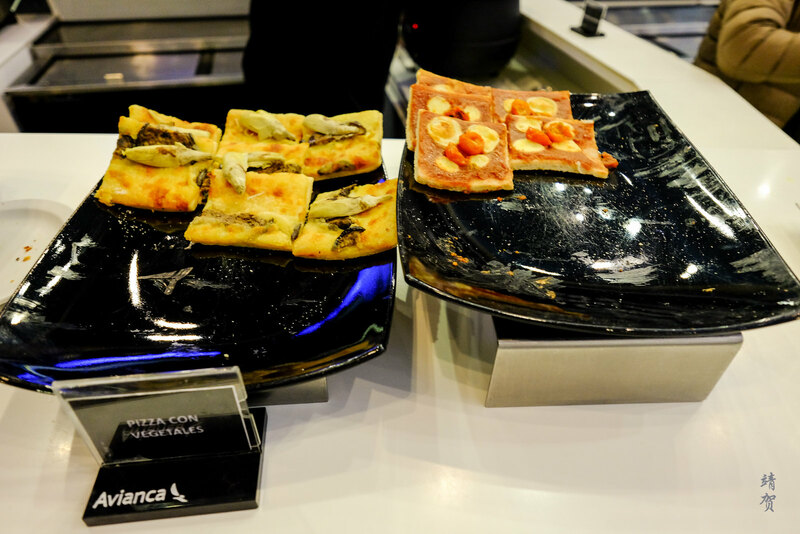 On the counters were dry pastries, quiches and wraps for guests who wants quick grab and go foods. 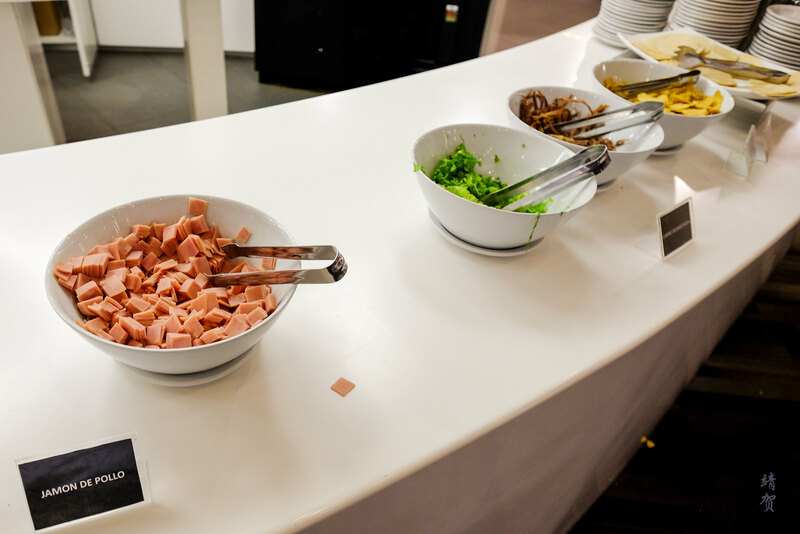 When I re-visited the lounge at night, they were still serving the salad bar and there was even mini pizzas on the buffet counter. 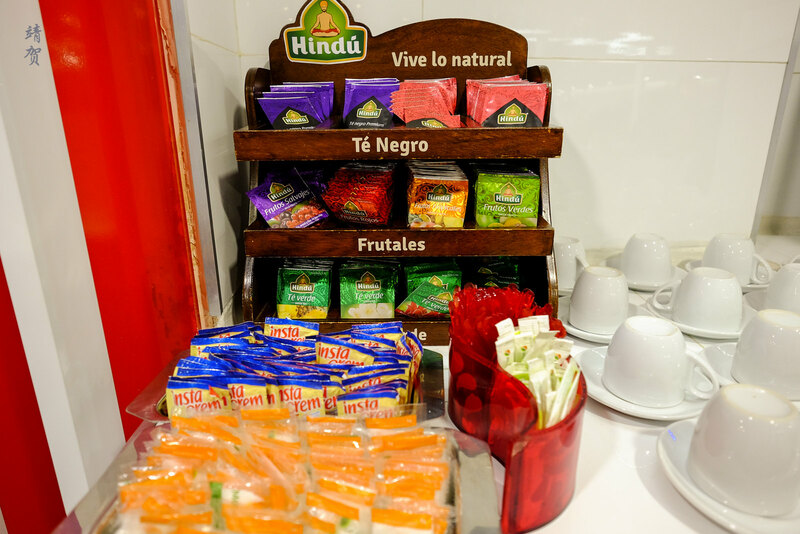 Fresh fruits like apples and bananas was available along with bowls containing dried nuts and cookies. 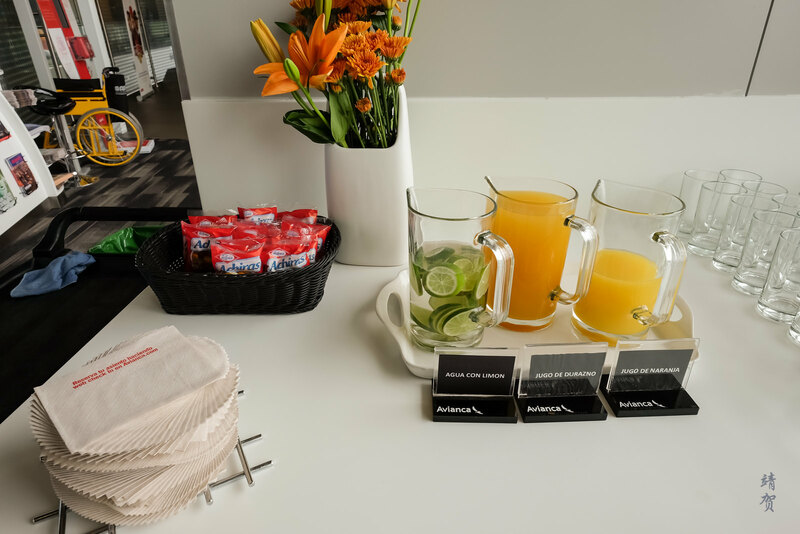 As far as I noticed the Diamond VIP lounge did not really offer anything extra as compared to the larger VIP Gold lounge which is located next to this lounge, and has more amenities like a shower room and a space for families travelling with children. 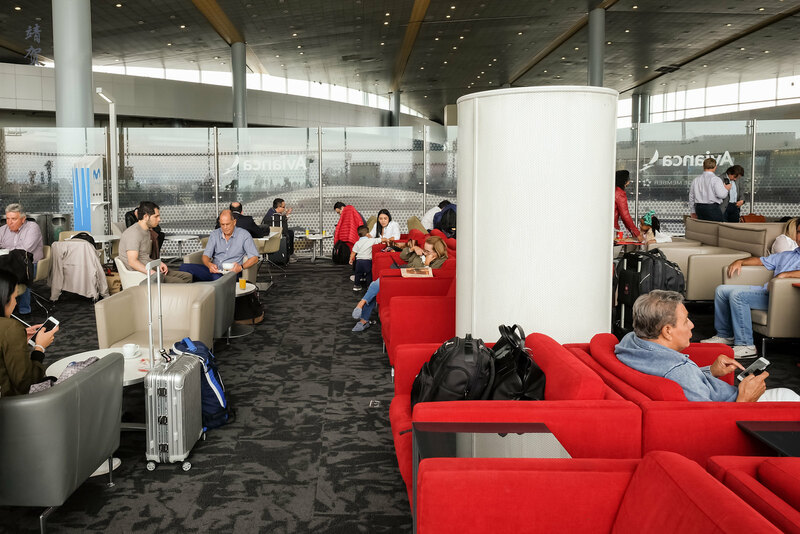 For my longer transit on the return trip from Lima to New York JFK via Bogotá, I head to the VIP Gold lounge which acts as the lounge for Star Alliance Gold members. Arriving in the evening, I requested for a shower room and there was 4 shower rooms in this lounge with one being out of order. One shower room is designated for disabled access. 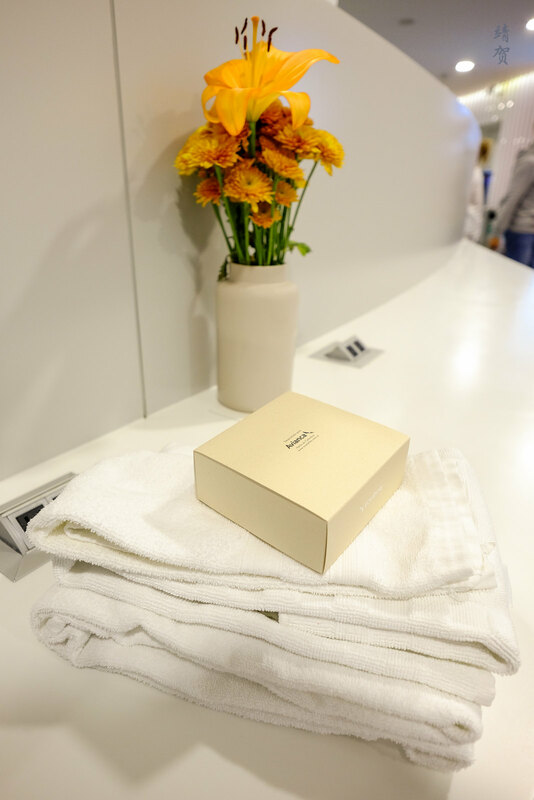 A box of amenities along with towels was provided to guests when checking in for the showers at the reception. 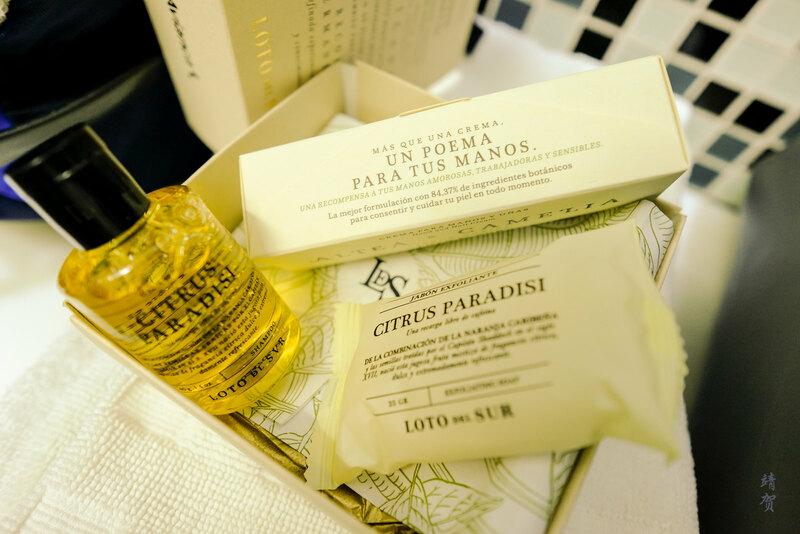 Presented in a nicely packaged box, there was a shampoo, a bar soap and a vial of hand and nail cream found inside the amenity. Thus if guests need a complete shower with liquid shower gels, they should probably bring their own. 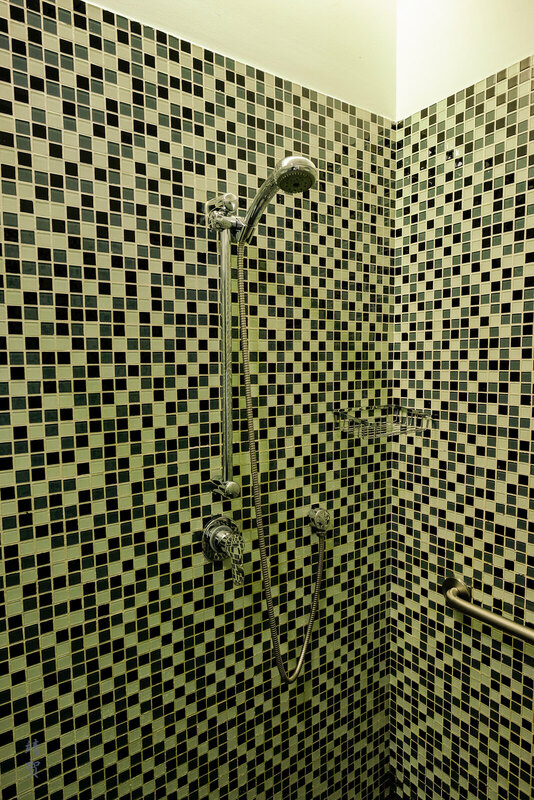 Inside, I found the shower room to be clean and decorated with mosaic tiles. 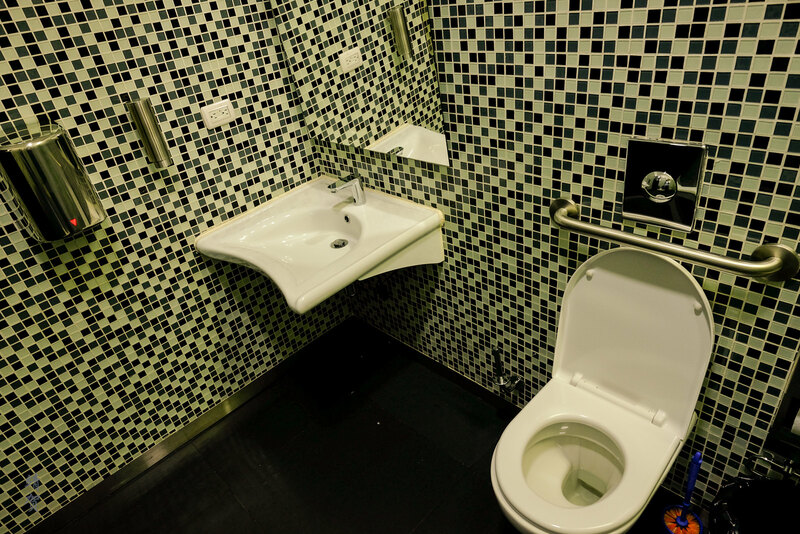 There was a freestanding washbasin and a toilet so there will be little space to place any bags. At the end there was a shower area with a glass partition. It was a very basic shower space with only a hand held shower head. At the least, the hot water was working and the pressure was adequate. Right outside the shower there was a partition that shielded guests in the lounge. 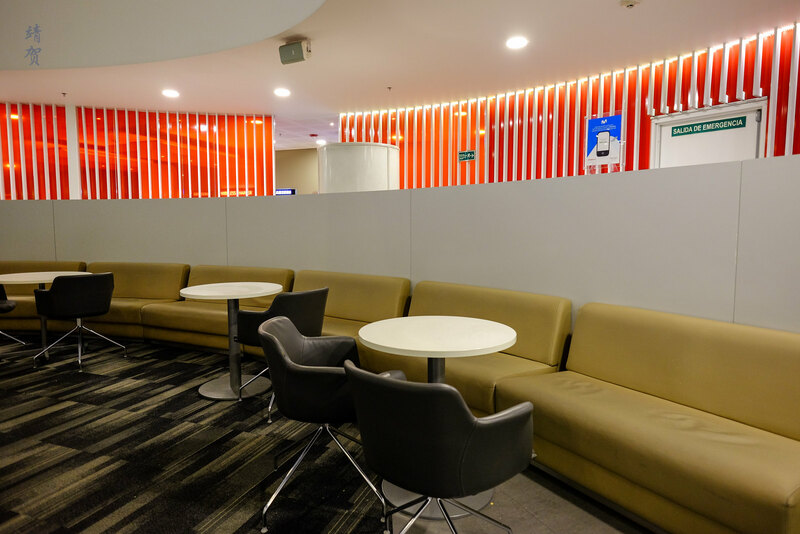 The back of the partition has bench-style seating with armchairs and smaller circular tables for lounging with some snacks and drinks. On the side of the lounge, there was more specific areas. One of them has a TV with odd-shaped coffee tables and more relaxing lounge chairs around. 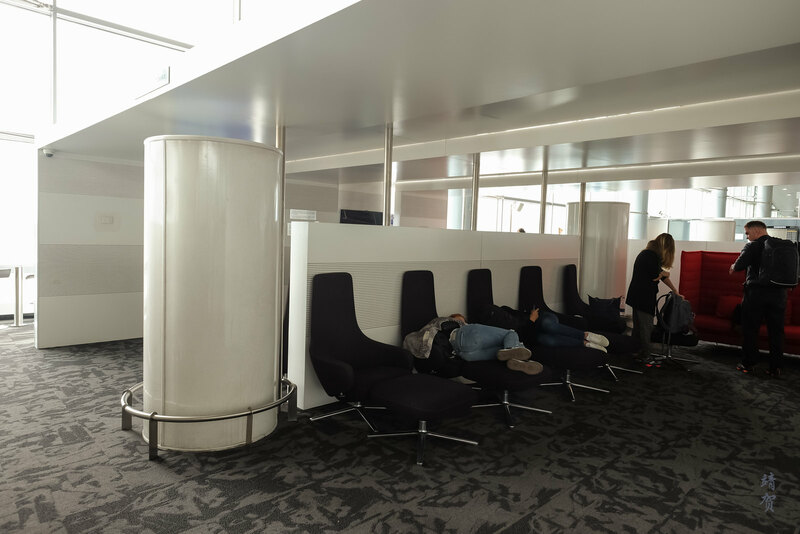 There is also a relaxation area with lounge chairs designed for napping set behind the TV lounge. 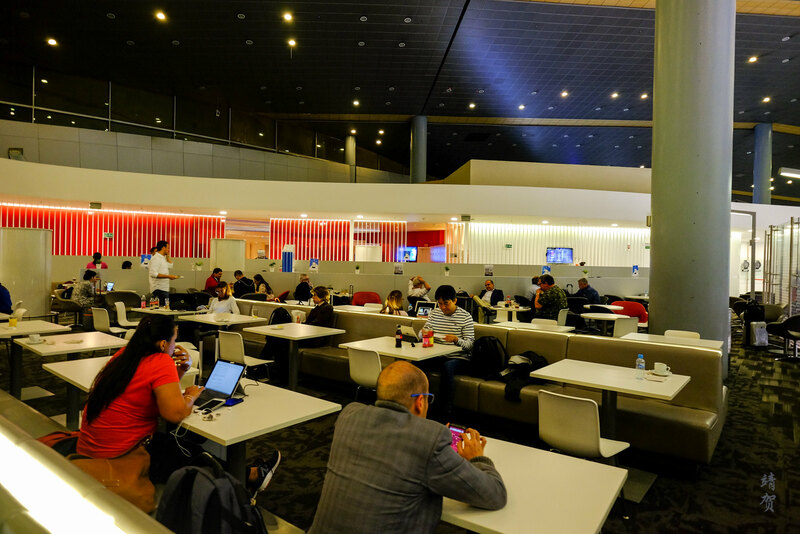 Another section is dubbed the productivity zone with wireless chargers and tablets on a table with a row of workstations and swiveling work chairs. 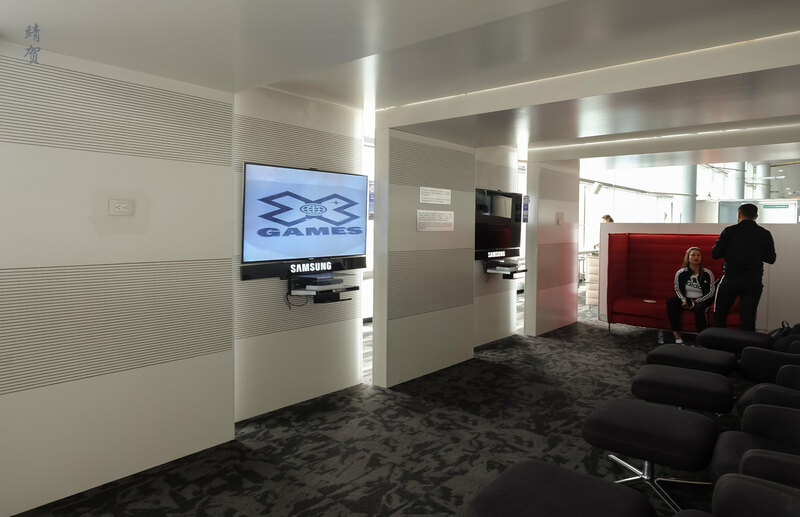 Both of these areas have TVs, tablets and chargers supplied by Samsung so maybe the lounge has got a sponsorship tie-up with the company. 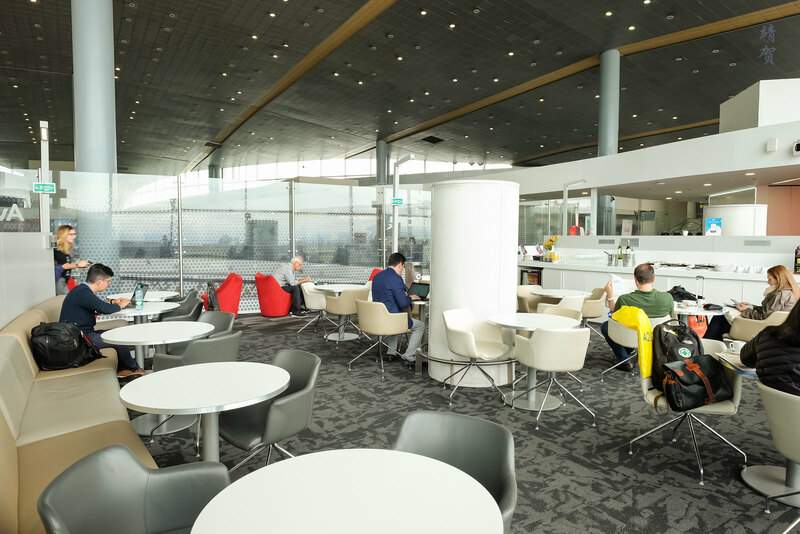 In the center of the lounge was the large dining area where there are plenty of white cafeteria style tables and chairs. Dining tables and chairs seems to make up the bulk of the seating inside this lounge and it was easy to find an empty space after our shower. 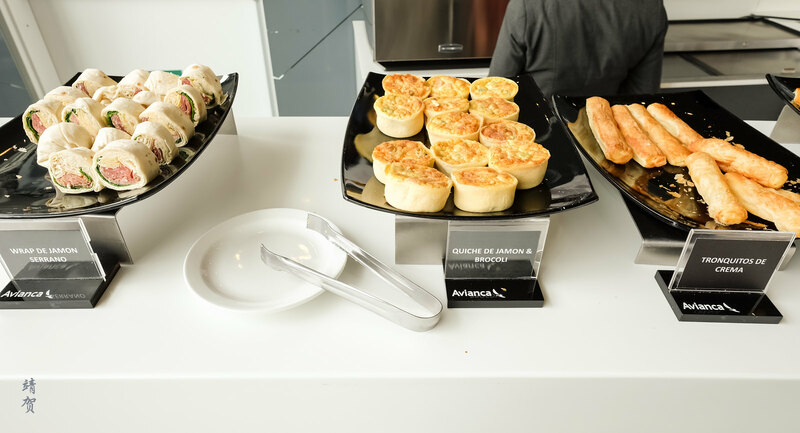 Food and beverages in the Gold lounge was average in terms of selection since there was no hot cooked food even in the evening around dinner time. 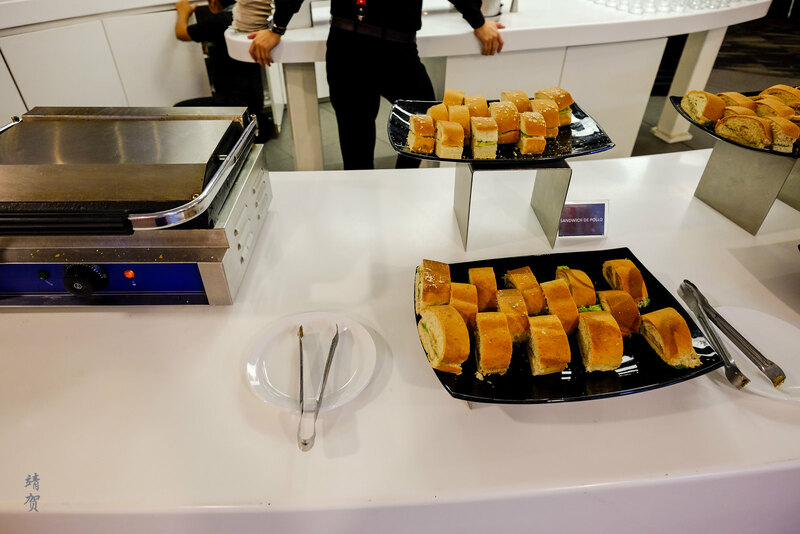 Food choices was between a variety of sandwiches where guests could heat up using the toaster on the buffet table. 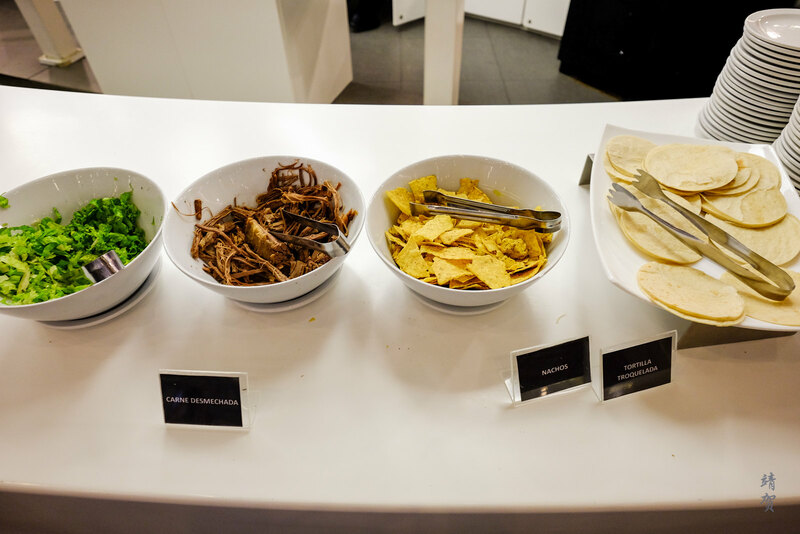 There was nachos and tortillas as well with toppings like ham, lettuce and pulled pork. 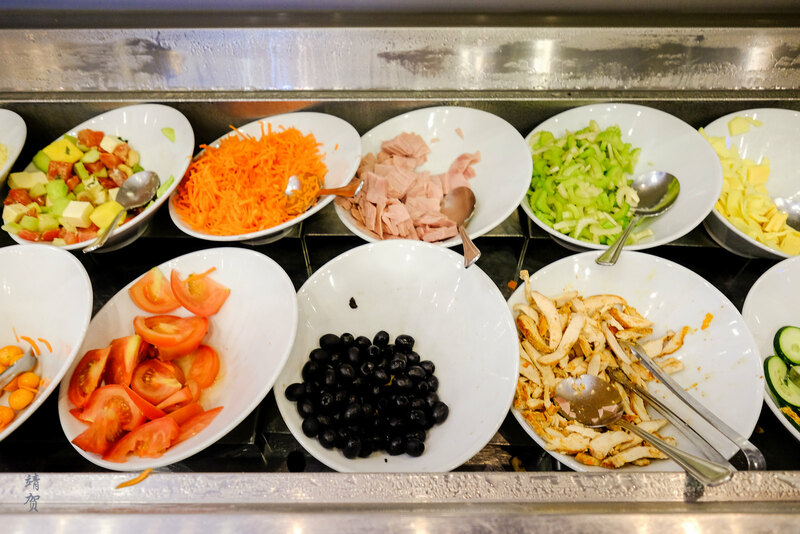 Alongside the nachos and tortillas, there was a variety of sauces and dips that they could add to add flavour. 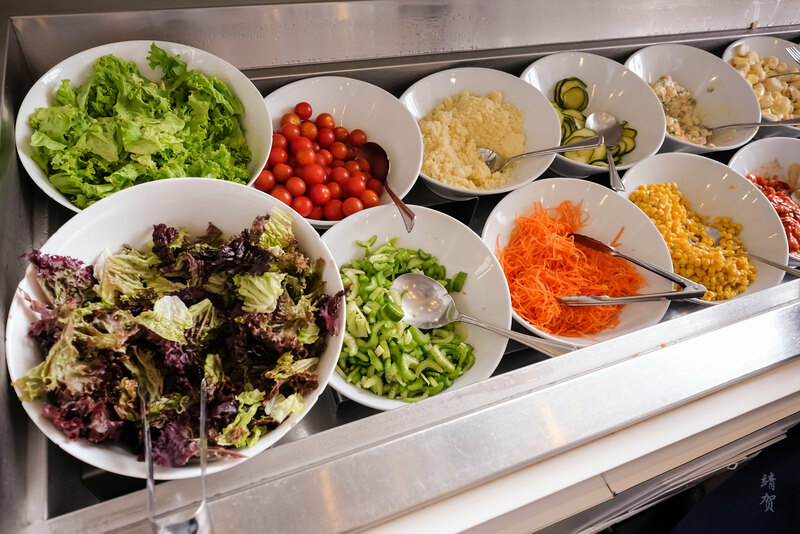 I did enjoy the fact there was guacamole served here since nachos and guacamole does make for a satisfying snack and maybe a light dinner if there was good protein dishes. 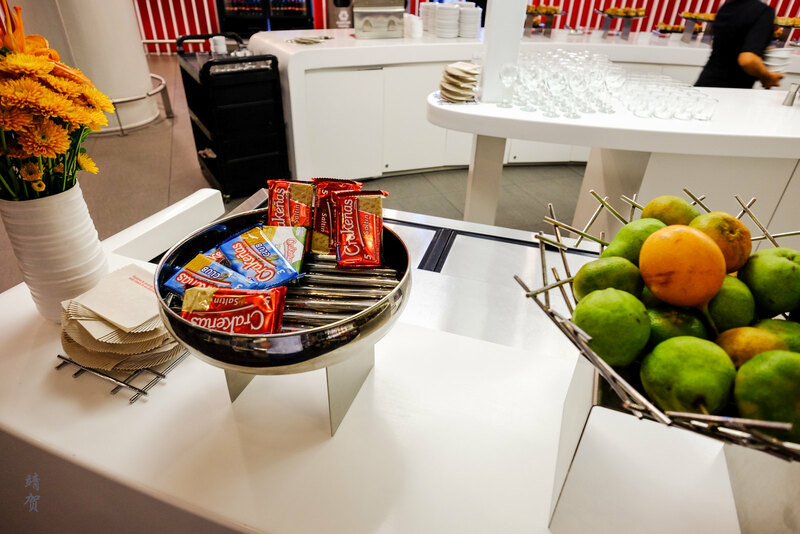 Other snacks found on the buffet console includes packaged crackers, fresh oranges and nuts served from a dispenser. 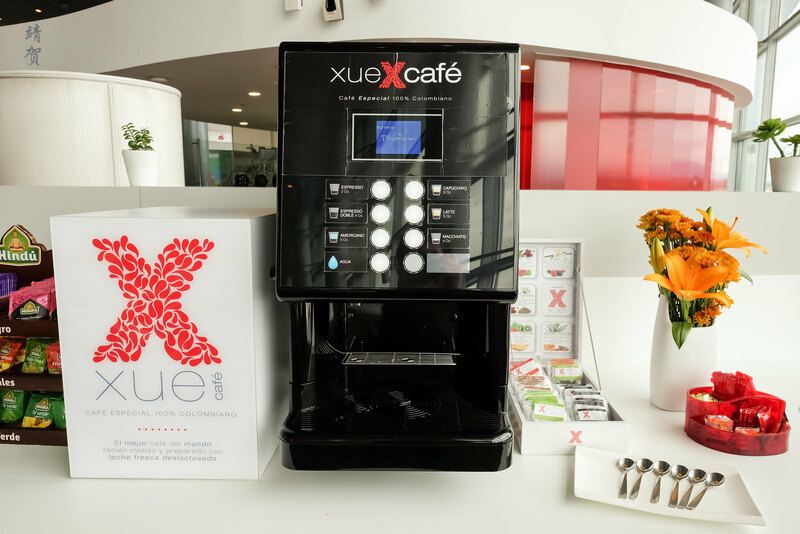 Some brownies and cakes are also served next to the coffee and tea machines at the corner of the buffet. 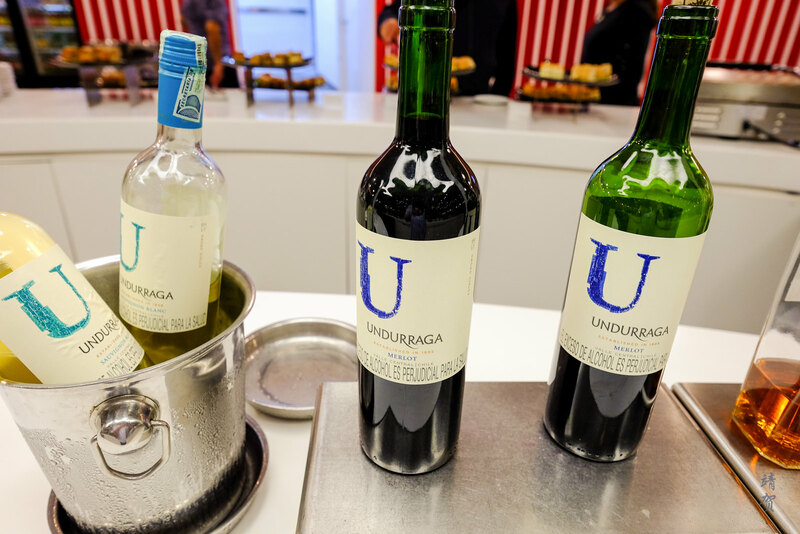 Beverages found in the self-serve bar in the middle of the buffet console includes wines by Undurraga, scotch and vodka. 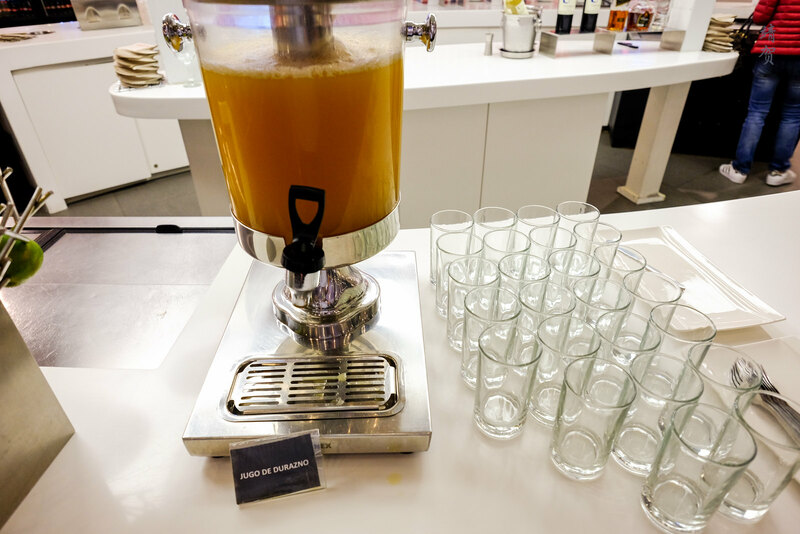 Peach juice was also served from the dispenser while there was more soft drinks from the bottle inside the fridge. 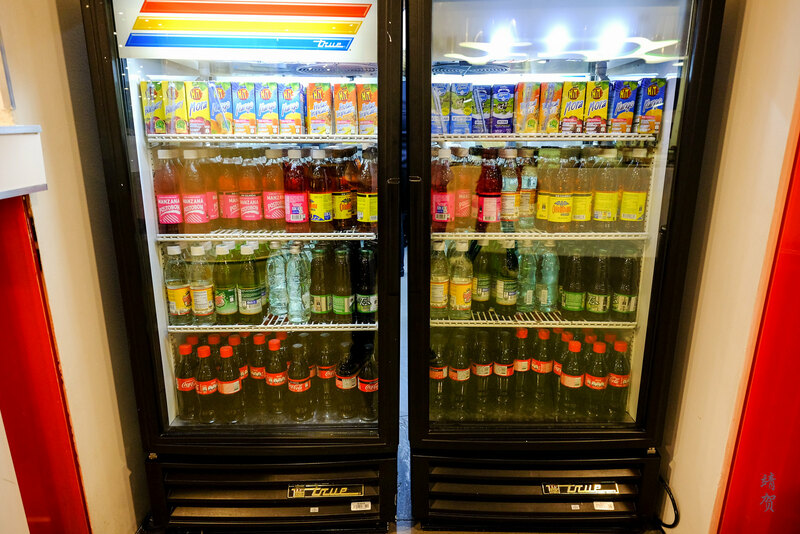 Bottled water can also be found inside the fridge. 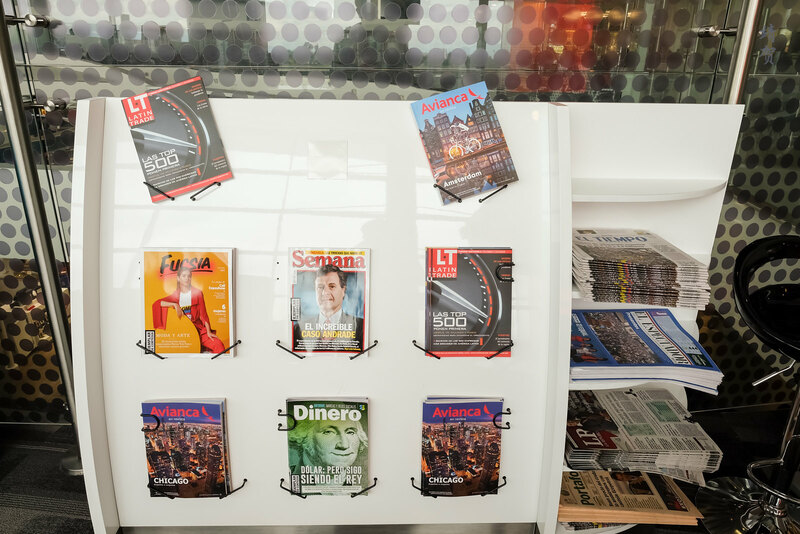 Newspapers and magazines can be found on the shelves beside the reception desk in the front of the lounge. 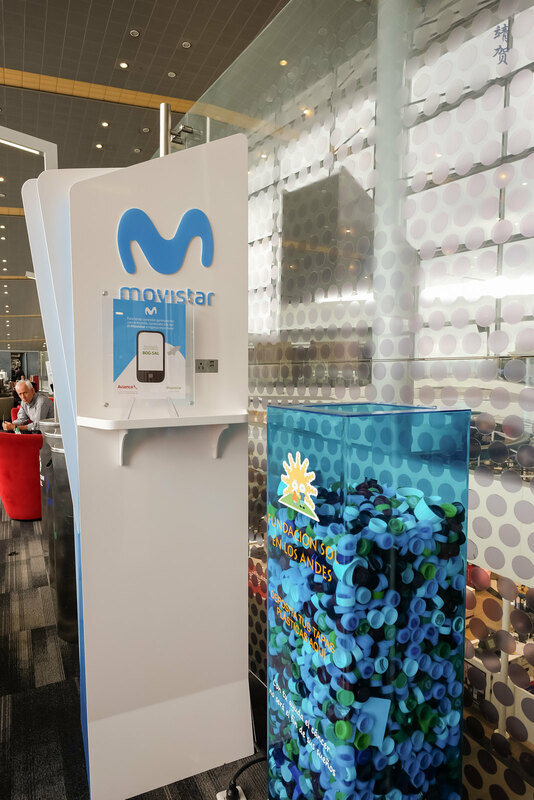 There was also mobile charging stations provided by Movistar, similar to the ones in the Diamond lounge. 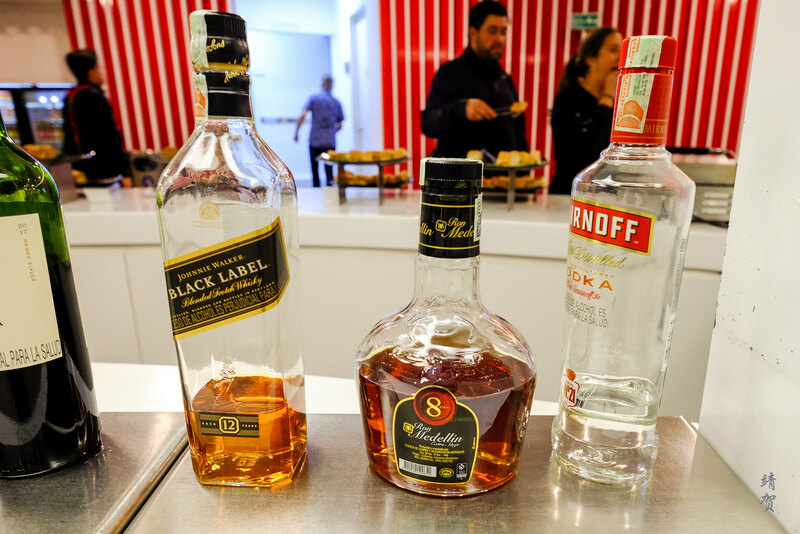 One major differentiation is that the VIP Gold lounge has no views of the tarmac but since it was already sun down when I arrived, it was darker and the Gold lounge seems to be more brightly lit at night. 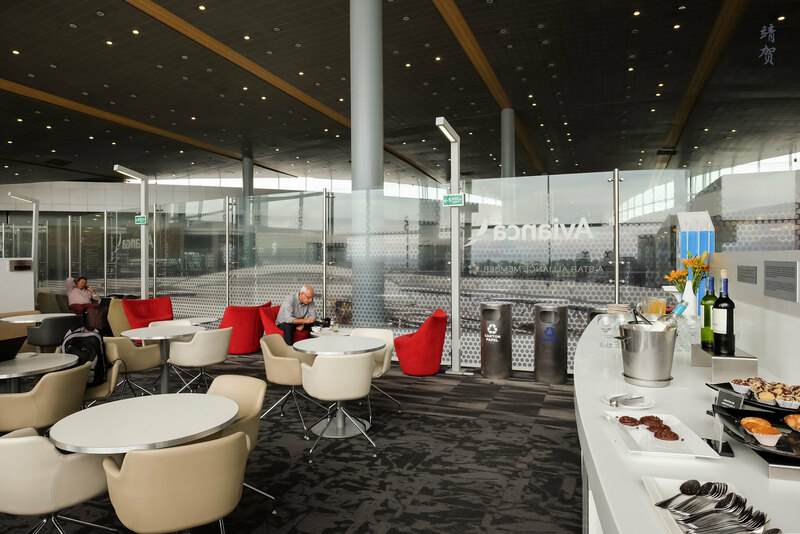 Most of the lounge seats inside the Gold lounge are in the TV area or by the sides along the glass partition that overlooks the terminal. 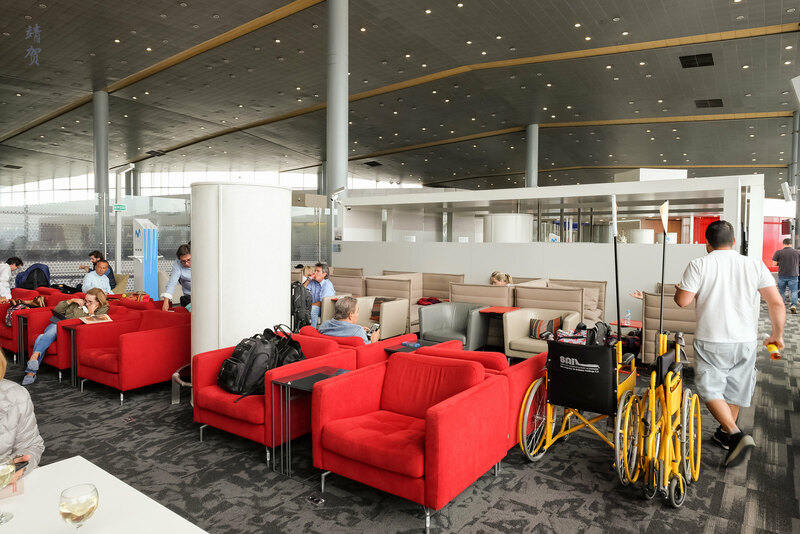 Another great facility they have in the Gold lounge was a special area for families traveling with children as there was a special carpeted area suitable with kids. 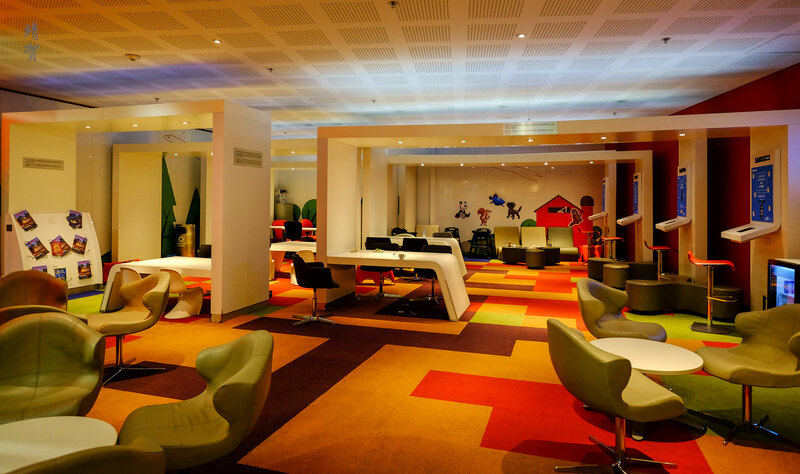 Inside this special section, there was baby chairs and game consoles for children along with TV showing cartoons and kid’s friendly programs. 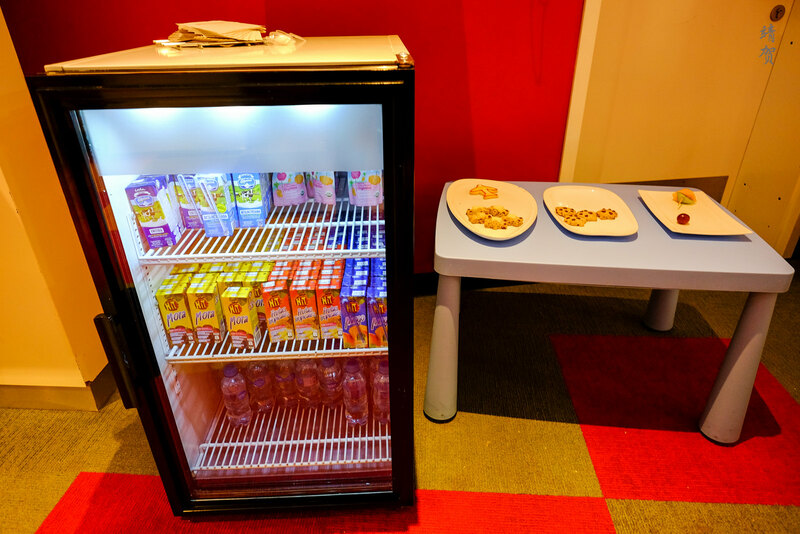 There was even a small drinks fridge serving packaged juices, water with a table serving cookies and kid’s snacks. 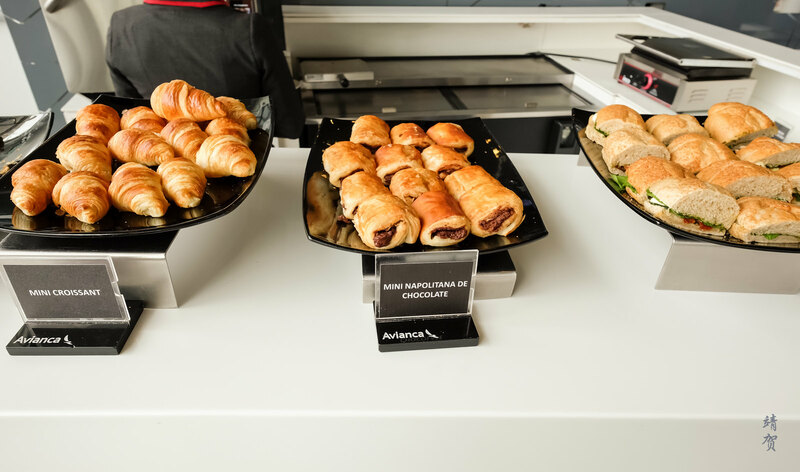 Compared to the VIP Diamond lounge, there was less food on the buffet even though there was more spaces to sit down and have a meal. 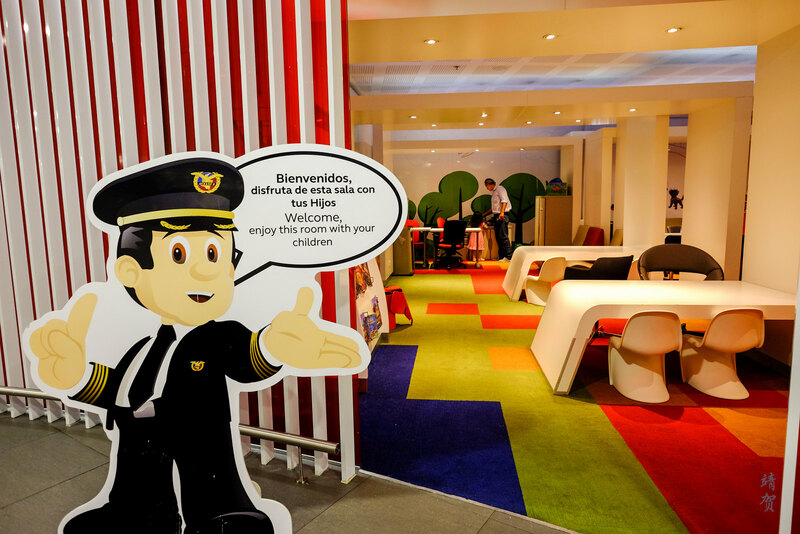 The Gold lounge was also larger and has more themed areas like the large productivity zone and the family room suitable for children. 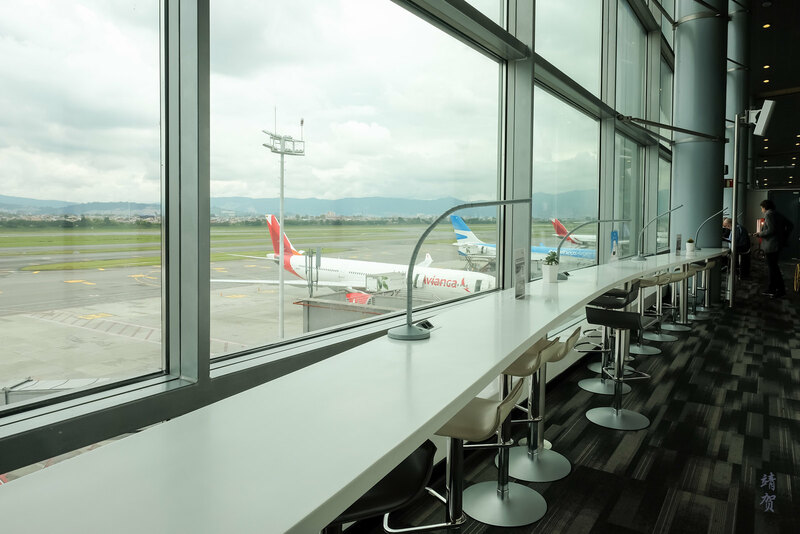 Both lounges were accessible for me when I was traveling on a Business class ticket onboard Avianca. 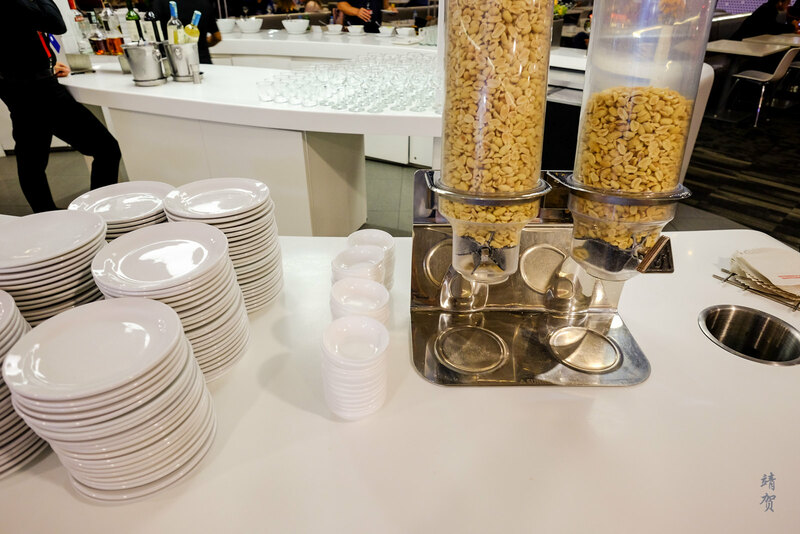 Travelers flying Economy might only have access to the Gold lounge if they are a Star Alliance Gold member and even then I found it adequate for short layovers as long as you did not need much food. 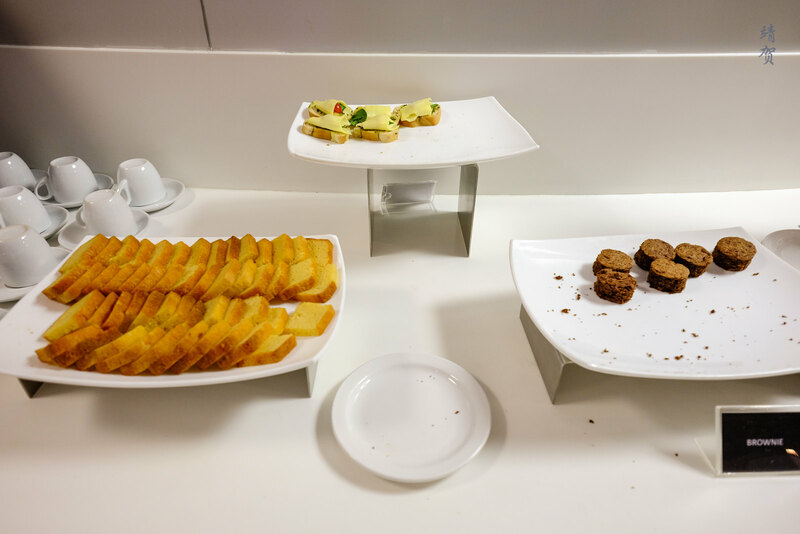 I tend to think of the food served in the Gold lounge on par with those served in United Clubs in the United States. 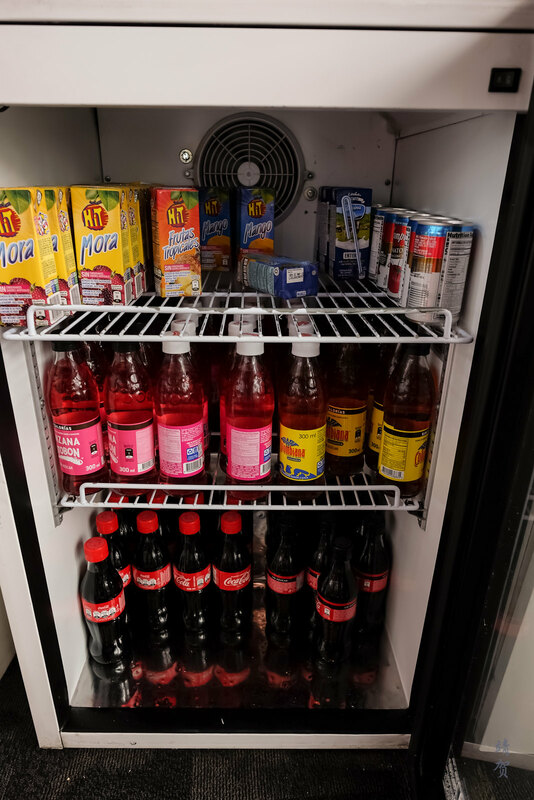 Even the Diamond lounge did not offer that much more. 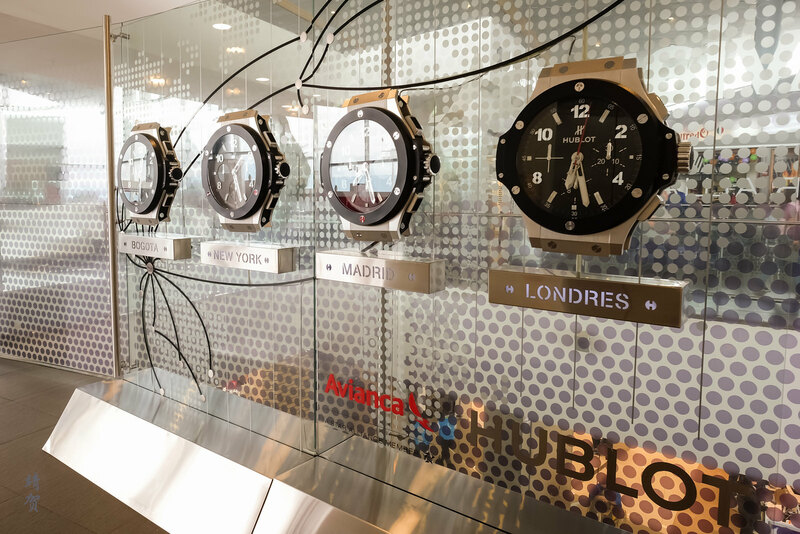 Thus in conclusion, I would only rate both Avianca lounges as sufficient for a major hub in a modern airport.